If you are missing a tooth because of periodontal disease, severe tooth decay, a traumatic injury or genetics, a dental implant can be the ideal tooth replacement. An implant is a small titanium post that Dr. Haradon or Dr. Lackler surgically embeds in your jawbone. This post becomes your new tooth root that fuses with the surrounding gum and bone tissue. When you’ve healed, a tooth restoration is attached. Dental implants provide several advantages over other tooth replacement options such as bridgework or dentures. Read on to find out what those advantages are. Lifelike tooth replacement. Because a dental implant substitutes for an entire tooth—both the root and the crown—it more closely resembles a natural tooth than any other replacement. Lifetime solution. A crown and bridge or denture should last five to seven years, maybe 10 if cared for very well. A dental implant, however, can actually last a lifetime if properly positioned. Securely anchored. With dental implants, you’ll never have to worry about a partial denture popping out of your mouth or a full denture that slips. Implants hold a tooth restoration firmly in place, so you can enjoy your food, speak with confidence and smile and laugh heartily. Maintain jawbone health and shape. Other tooth replacements only rest on top of your gum tissue. As such, they cannot promote healthy tissue growth in your jaw the way an implant can. Every time you bite down or chew, the implant stimulates your jaw. The result is a jaw that maintains its shape so your face retains it natural shape, too. Protect healthy teeth. A tooth-supported bridge requires your dentist to file away a portion of tooth structure on the teeth that abut the gap in your smile. This is done so that the crowns that secure the bridge will fit comfortably in your mouth. With dental implants, however, there is no need to alter any teeth. 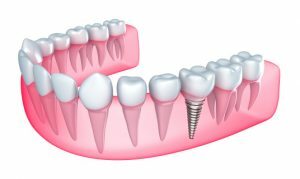 The implant is simply positioned in the exact location of a missing tooth and does not negatively impact any other teeth. Routine oral hygiene. To care for dental implants, you only need to brush and floss just as you do for your natural teeth. They are never removed for cleaning and you’ll never see them sitting in a glass on your bedside table. To learn more about the benefits of dental implants, 80909 residents can contact Rocky Mountain Periodontal Specialists. One of our staff will be glad to answer your questions or schedule a consultation with Dr. Haradon or Dr. Lackler.